North Korea South Korea Relation is getting a new turn, USA can be the obstacle. This September South Korean President Moon Zay-In has visited North Korea's capital Pyongyang. He went on a two-day tour to discuss the issue of nuclear disarmament and the formal end to the war between the two Koreas with North Korean leader Kim Jong Un. When he reached Pyongyang, Kim, his wife Re Sole Zoo and other senior officials of North Korea welcomed him cordially. At the time, Kim embraced Moon with a smile. Hundreds of North Koreans were chanting slogans. They were shouting : Welcome! Welcome! There were slogans like 'Two Korea One Again'. Hundreds of Korean male and female wearing Korean traditional suites and Koreans dresses were there to welcome Moon with flags, flowers and banners. After lunch, the two leaders sit in the ceremonial meeting. It is the third meeting between Kim and Moon this year. There were some corporate officials as well with Moon as visitor. Among them Chairman of Samsung Electronics and Chief of LG were main. This conference is considered as the 'Litmus Test' before the Trump-Kim meeting. 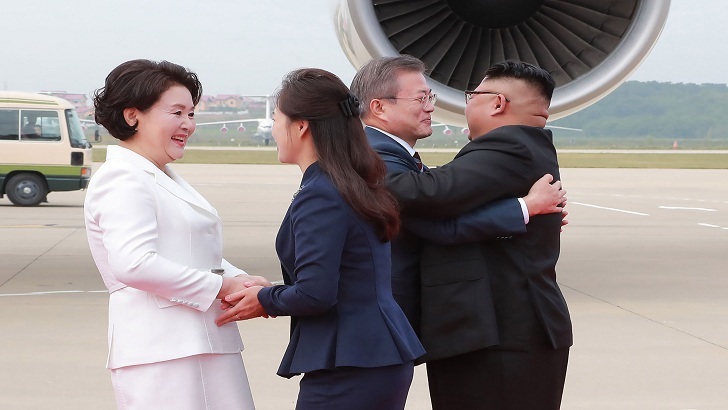 Moon is trapped in between Kim-Trump! South Korean President Mon Zay-In is arbitrating between Kim and trump to put US President and North Korean leader on the negotiating table. The purpose of this discussion is to discourage North Korea from the nuclear program. South Korean President is meeting with North Korean leader three times since April last. This third meeting is a lot more challenging than the other. South Korean President needs to make progress in negotiating North Korea to abandon nuclear weapons. Otherwise the two Korea talks, meeting of Trump and Kim will all be limited to photosation only. 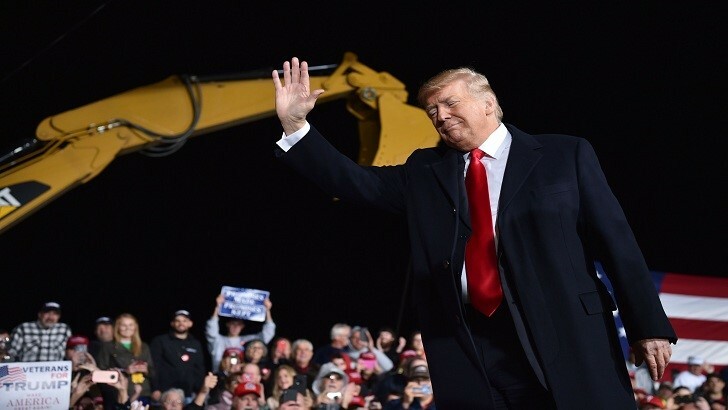 At one stage, US President Donald Trump could lose his patience. In South Korea, the popularity of the South Korean President has lowered recently. If he wants to come out of this situation, he must bring progress in negotiations with North Korea. US President Donald Trump said after a meeting with the North Korean leader in Singapore last June that there is no threat of nuclear attacks from North Korea. But many observers believe that North Korea will not step away from their nuclear program. North Korea has created their nuclear weapons for so many years. The question is - why will they move away from there? The promises made by the North Korean President so far is very unclear. It needs to be changed. The North Korean president expressed his regret to the South Korean leaders who met with him this month - the international community has not given importance to its commitment even if it promised to cancel the nuclear program. The White House informed North Korea tested their latest missile 10 months ago. This is a kind of progress. But the satellite image shows that North Korea is continuing to carry out their arms reserves. US President Trump has thanked Kim Jong Un for not launching a missile show on North Korea's military operation on September 9. No matter what people say in public, Trump Administration believes there is a shortage of North Korea's interest in shutting down of nuclear weapons. The main work of South Korean President is to keep an eye on Donald Trump and Kim Jong Un to reinstate the discussion table. Washington wants closure of North Korea nuclear program before making any peace agreement. South Korean President Mun Jeanne-in-Parent, who is carrying personal burden, escaped from North Korea during the war in Korea. At that time about 100,000 people fled to South Korea. The future South Korean President was born in the refugee camp. Moon Zay-in's parents want to be buried after their death in North Korean soil. South Korean President has to fulfill this wish of parents. At one time he thought that he should not talk with the communist North Korea. But South Korea's President now thinks that North Korea is slowly shifting. But he has a bit of hesitation in whether North Korea will truly change it. A historic agreement has been signed on nuclear disarmament between North and South Korea. By this Korea is moving forward to peace. This agreement was signed between South Korean President Moon Zaye In and North Korean leader Kim Jong Uni on Wednesday in Pyongyang. South Korean President Moon Zaye In said in a press conference that the two sides agreed to find a path to nuclear disarmament. He said Kim Jong Un had agreed to close a North Korean missile launch center. North Korea's leader Kim Jong Un described the treaty as a stepping stone to further protecting the Peninsula. 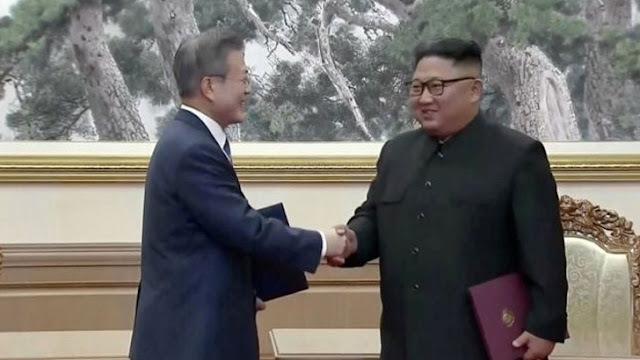 In addition to the nuclear disarmament, the agreement also includes reconciliation of families that have been divided during the Korean war, establishment of rail links, health care cooperation and so on. After signing the deal, South President Mun said, North Korea agreed to permanently stop the Tongongiri missile test and launch center. North leader Kim Jong Un said that he promised his neighboring country leader that he will go to South Korea next year. 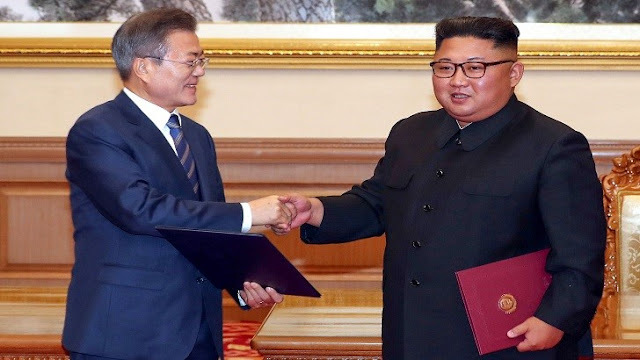 In addition, an agreement was signed between South Korean Defense Minister and North Korean Army Chief to reduce military concerns among the two countries. 250 Kilometer long border area. About 8 million landmines in this border so that not even any animal of the enemy country dare to cross the line. In the 1950-53 Korean War, and later, in their respective parts, North and South Korea put those mines into the ground. The landmine that has been buried for nearly 70 years will be removed. This is not just any news, it is a great news for both the korean countries and the rest of the world as well. This year, the unprecedented improvement of the two countries is being noticed. In September, the meeting was held for the third time between Northern Junk leader Kim Jong Un and the South President Mun Jaye In. North Korea has offered two dogs to South Korea as a symbol of good relations between the two countries. They also have different names. One name Gomee another named Songang. They were dispatched to South through the unmanned area of ​​Panmunjam with three kilograms of food for dogs. During his visit to Pyongyang, Kim and his wife Re Sole Zoo expressed their desire to present dogs to the South President. South Korean President Mune Zaye In said that the complete end of the Korean Peninsula war is just a matter of time now. In an interview given to the BBC in Seoul, he said this. 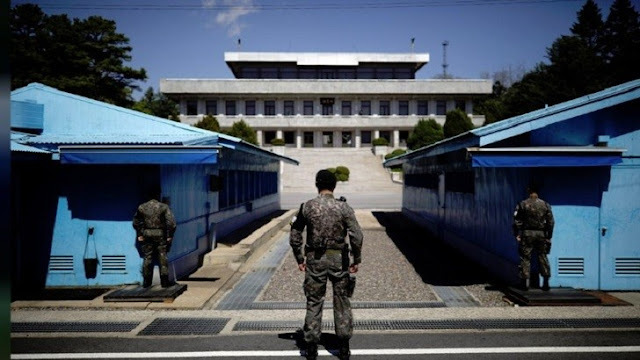 It is to be noted that the Korean War, which started in 1950, is under ceasefire agreement since 1953, but the peace agreement remains still hanging. This huge issue is in its way to be solved. But USA can stand in the way of the historic steps taken by the South Korean President. We can sense it from the words of the mighty TRUMP. Son of North Koreans refugee father, Moon said, he is trying to persuade the North Korean leader Kim Jong Un to nuclear disarmament. However, it is important to have a much more diplomatic effect on the matter. At this time, he called Kim a 'very outspoken' mouth. Moon has expressed his expectation from the European leaders in mediating Kim and Trump. According to Moon if North Korea takes proper steps then the end of the war can be a political announcement which can solve the issues between Washington and Pyongyoung which is going on for years. But recent statements of Trump are not that much warm. As he claimed that South Korea has to take permission from US before removing the sanctions they had against North Korea in the year of 2010 because of a ship-drowning. At that time Seoul banned Pyongyoung for tourism, trade and fundamental helps as well. And now Trump is trying to make an issue out of it. Meanwhile North and South Korea have taken steps to re-initiate one road one rail protocol of them which was established by Japan before the second World War. In this situation where everything is going towards a happy ending of the Korean War Trump can be a key factor deciding whether peace will be introduced or not. He should be dealt diplomatically by the Korean leaders so that he cannot make some unreal issues out of it.